Many students take Organic chemistry in the summer because the curriculum is cut in half. You have only 8 weeks instead of 16 and the material is covered much more quickly. This can be a great time-saver for your academic calendar, but it makes your studying twice as more challenging! This class will be very fast paced, anywhere between 50-100 reactions will be presented, and the organized student will be the only one to get a great grade in the class. Fortunately, we here at StudyOrgo have developed simple, clear-cut explanations to help simplify your studying and maximize your time. Follow these tips for studying this semester and sign up with StudyOrgo today to help you get all of your reactions mechanisms and descriptions instantly! Read ahead – You only have 8 weeks for this class, so staying up on the material is absolutely the most important thing to do!! Read two chapters this week to catch up and get yourself ahead of the class. Don’t try to understand everything, just read the text and try to understand the big ideas. After you have read the chapter on the material for the next lecture, you’ll find it will completely change the way you pay attention in class. You will pay more attention and come up with questions about the details of the material that are tricky, rather than scrambling to write down notes and drawings. Attempt ALL homework problems – Students, who pay hundreds of dollars for a single tutoring session, are often intimidated when we ask them to try sample problems. But after a few examples, every student does them better and better with each new problem. Some students have even made comments such as ‘why didn’t I do this sooner?’ We couldn’t agree more! Practicing the problems will make it easier for the quizzes and tests. We have even developed a Quiz Mode that each student can customize to their studying needs. Our presentation also allow for Flash Card mode, which allows you to quiz yourself as you study! Read everything listed on the syllabus – Remember, your syllabus is an official contract between you and the professor. Professors are required to disclose what you are required to learn and how you will be graded. Professors usually remove requirements (to the delight of the students!) but cannot easily add them. Use this to your advantage! Highlight the contents or reactions of the book that will be required and use this to focus your attention when studying this semester. Schedule your studying! –Another useful tip that past students have succeeded with is to take a calendar and divide the time you have until the next test by the number of chapters. Schedule 2-3 hours a week AT LEAST to study and DON’T SKIP OR RESCHEDULE. Use your iCal, Outlook or other smartphone calendar to send youself alerts and reminders for your studying appointment. Sign up with StudyOrgo – The content of a StudyOrgo.com membership includes detailed mechanisms and description of over 175 reactions in the most crystal-clear and “get-to-the-point” format possible. Many of our reaction have multiple examples, so you can learn and then quiz yourself in our website! For the student on-the-go, we have also developed a mobile app (iOS and Android) which provides all the functionality of the website! All of these benefits are included in your StudyOrgo membership! 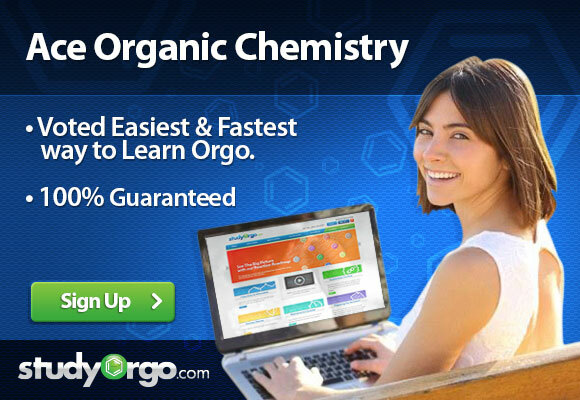 With good time management and help from StudyOrgo, you WILL get a top grade in your summer Organic Chemistry course. Sign up today! !